Big update: IL 255 is now open from I-270 to IL 143. For the overview of what the ceremony went, go here. FAP 413, a.k.a. "Alton Bypass" was first talked about in the River Bend Region in early 1976 after the locals thought that the feds had overlooked them. When the interstate system was conceived, Illinois submitted a plan for a freeway in the Alton area -- that freeway got rejected and all the River Bend Region got was Interstate 270, which is 10 miles south of Alton. The plan was to go from the proposed intersection of I-55/70 and I-270 near Fairmount City to just north of the US 67/IL 111 and IL 267 spilt in Godfrey. The entire freeway was to be 4 lanes and built to interstate standards. However, there wasn't much money to even make that plan feasible in 1976 and the locals would realize that they needed the Berm extension, Homer M. Adams Parkway extension (a.k.a. "Beltline") and the New Clark Bridge more than the freeway. Another reason was that the proposed "270" from the JB Bridge to I-55/70 was still on the drawing boards in 1976. A couple years would past and a new District 8 engineer would take over at the IDOT Collinsville office. (He recently retired from that job.) His top priorty was to get the current I-255 built when he took the job, then worry about anything else that has/need to be done. Somehow, he persuaded the feds to add the first 5 miles of the Alton Bypass plan to the I-255 beltway (from I-55/70 to I-270) in the early 1980's; that section opened on July 26, 1988. Here is a part of the St. Louis Post Dispatch article on March 19, 1988 by Pat Guien. "Earl Lazerson, president of Southern Illinois University at Edwardsville, said that the proposal to build Freeway 413 was important to prosperity in Alton. ''This is not one where you have to get somebody's opinion. Just attempting to get to Alton is very difficult,'' said Lazerson, chairman of an advisory committee on the highway project. Numbers help illustrate the need. The Illinois Department of Transportation estimates that the southern reaches of the approximately 22-mile freeway would carry as many as 35,000 vehicles a day. That is about a third as many as the number of vehicles that use the Poplar Street Bridge, which is considered one of the busiest stretches of road in the Midwest. James R. Pennekamp, president of the Greater Alton/Twin Rivers Growth Association, said that Freeway 413 would both unlock commercial potential and help the area keep the commerce and residents it already has. Alton might have been a logical choice for the original interstate highway system. That could have been done by nudging Interstate 55 a little further to the west as it approached St. Louis from Chicago. But that planning was done 25 to 35 years ago - by people who for the most part are no longer around to explain it, said Kent L. Muskopf, district planning engineer for the state transportation department at Collinsville. ''There's no doubt about it,'' Muskopf said - Alton got left out. Plans for a remedy were made in the early 1970s, and a small amount of work was done. Freeway 413 was born in ambitious years when Illinois expected to build supplementary freeways of interstate quality to virtually every community of 10,000 or more people who lacked easy access to an interstate. The idea was for 413 to continue north from where Interstate 255 meets Interstate 55-70, up the western edge of the state. In 1976, planners realized that the full project would be too costly. But they continued to hope that it might be built at least as far as Godfrey, north of Alton, where U.S. 67 and Illinois 267 feed traffic north and northwest with two-lane highways. Eventually, the federal government was persuaded to include the very southern tip of 413, from I-55-70 near Collinsville to I-270 near Edwardsville, as an extension of I-255." But the problem is not comical for the area's residents. The Alton area is one of the larger territories that the interstate highway system forgot. Meanwhile, traffic on existing north-south routes - Illinois 3, 111 and 159 - is growing beyond those roads' capacities. ''From our perspective, we think it is necessary that within the next 10 years something will have to be done,'' Muskopf said. The plans were approved in December 1991 by IDOT and in July 1993, construction on the first stretch, from I-270 to IL 143, started in mainly rural land. The construction on the first stretch of 6 miles is nearing completion and should be open around October 1998, after 5 years. Although there is no new construction scheduled after that (it appears that IDOT is currently spending their money rebuilding other highways), contracts have been awarded for the demolition of 110 homes in the Bethalo area. Most construction will be in rural areas, with the exception of the construction scheduled in Bethalo and in a few parts of Godfrey. There is no time schedule of when the entire 22-mile project, costing around $280 million, will be completed. However, the construction of the next section from Route 143 to Route 140 could begin in 1999. The House Transportation and Infrastructure Committee this week approved $4.275 million for use on Illinois Route 159 in the Edwardsville area and $2.5 million for land acquisition needed for the extension of Interstate 255 from Illinois Route 140 to Fosterburg Road. The Alton Bypass has been alloted $2.5 million for land acquisition between Route 140 and Fosterburg Road. The new four-lane connector will eventually join I-255/270 and U.S. Route 67. U.S. Rep. Jerry Costello is the primary sponsor of the bypass project, which is a 22-mile segment of roadway estimated to eventually cost $100 million. So okay, it's not part of the interstate system even though its going to be built up to standard. So what choices are left? 2. It could be called "New 111", but that has several drawbacks. First, it would have to be multiplexed with I-270 for 3/4 mile, which isn't very necessary in reality. Second, the county highway department would not be able to maintain the current 111, which has changed very little ever since it was commissioned. Also, the locals do not want the current 111 changed at all. Another disadvantage would be the same as the first one, two different route numbers on the same roadway. 3. IDOT could choose an entirely different number but I doubt the locals would accept it too well. Second, like the first two, it actually puts two different numbers on the same continouos route, which can be confusing to anyone. Although it has drawbacks (the most common reason is that it's likely going to be mislabeled by the locals), the drawbacks aren't as dramatic as the first 3 options. There is (somewhat) a drawback to the fact Wood River has an "255" telephone prefix, but ever since they started using that prefix in 1988, I have seen only an handful of such telephone numbers being used today. I doubt that will change unless major growth hits the Wood River area. If the address is unfamiliar, it's because that piece of freeway is not scheduled to open until this fall. It will extend north six miles from where Interstate 255 ends at I-270. While it is a continuation of I-255, the new piece of highway is not officially part of the interstate highway system. With that, an article was released in the Alton Telegraph on March 18, 1998 confirming the possible route number may in fact be Illinois 255. (View full article here. "Work to improve Route 157 also is unfunded, as is the extension of Interstate 255 (to be called Illinois Route 255) north of Illinois Route 143." Recent updates (sept 19, 1998): It is IL 255 according from those signs from I-270 in Potoon Beach. Its pretty much an example of IDOT saying "Forget the damn debate" and you know the rest of the freaking thing. Meanwhile, every sign for Exit 7 on I-270 has been torn down and replaced and the last 5 signs on I-255 north has been replaced. Tarp has been covered, but not real well -- sometimes with the sun at your back you can see the IL 255 control city: Wood River -- right thru the blue tarp. A message to residents of Wood River: Don't confuse phone numbers and highway numbers now -- get it?? 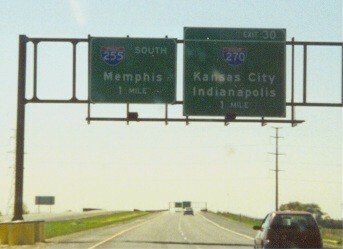 The installation of guide signs, mainly on I-270. However, from the way I saw it, you might not know about the Alton Bypass until you're on the I-255 south ramp. There are a couple spots on westbound 270 that signs haven't been installed yet even though the sign posts were put up in May. There has been absoluetly no changes to northbound 255 just south of 270 as of yet. However, the northbound lanes have been striped. I took Route 111 up to the Alton area as usual. If you look to the right, you can some guide signs have been already installed just north of 270. I was unable to venture out on any other road that I know where you can make observations that day. One last thing I've been noting throughout most of August: Both the Alton Telegraph and the St. Louis Post-Dispatch have been getting in the habit of knowing what is I-255 and what is IL 255. However, I haven't seen any examples of the Belleville News Democrat and the Edwardsville Intelligencer about this. I don't think most locals would even care about what is what (just as long you don't confuse telephone numbers with any Wood River-area prefix). First advance guide sign for the I-270 exit on southbound lanes of the Alton Bypass. The second advance guide sign is almost an exact carbon copy of this one, only the difference is that the sign reads "1/2 mile" instead of "1 mile"
In the future, I plan a better-written essay about the Alton Bypass, using articles found in the St. Louis Post Dispatch Archives and from some personal experiences. Right now, this will do me just fine. If you have any more information, please email me. Last updated on October 14, 1998. This page has no affiliation with Illinois Department of Transportation!